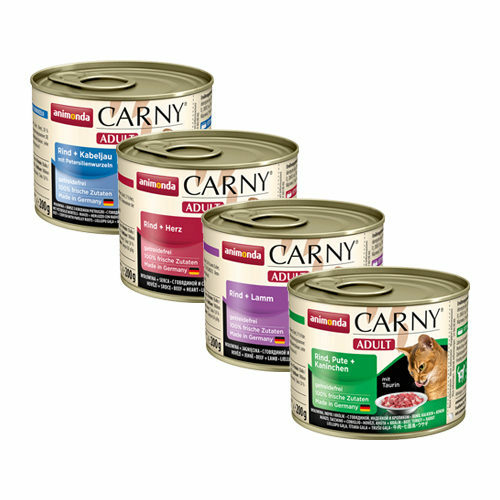 Animonda Carny Adult is delicious wet food with 100% fresh ingredients for adult cats. The food contains real pieces of succulent meat with natural taurine. Carny Adult, made by Animonda, is balanced, tasty and healthy wet food which your cat will think is paw licking good. The food has been specifically tailored to meet the nutritional needs of adult cats aged 1 to 6. Carny Adult contains delicious pieces of fresh meat. The food also contains taurine. The food is grain and soy free. Animonda Carny Adult - Beef with Deer and Cowberries: 57% beef (meat, liver, lung, heart, kidney, udder), 8% venison, 1% cranberries and calcium carbonate. Animonda Carny Adult - Beef with Cod and Parsley: 45% beef (liver, lung, heart, udder, kidney), 20% cod, 2% parsley roots and calcium carbonate. Animonda Carny Adult - Beef with Beef and Chicken: 35% beef (lung, heart, kidneys, meat, udders), 30% chicken (liver, meat, stomach, throat) and calcium carbonate. Animonda Carny Adult - Beef with Heart: 48% beef (meat, lungs, liver, kidney, udder), 17% heart and calcium carbonate. Animonda Carny Adult - Beef with Lamb: 39% beef (heart, meat, udder, kidney), 26% lamb (liver, lungs) and calcium carbonate. Animonda Carny Adult - Beef with Chicken and Duck: 37% beef (lung, heart, meat, udder, kidneys), 20% chicken liver, 8% duck hearts and calcium carbonate. Animonda Carny Adult - Beef: 65% beef (meat, heart, lungs, liver, udder, kidney) and calcium carbonate. Animonda Carny Adult - Beef with Turkey and Shrimp: 36% beef (lung, heart, meat, kidney, udder), 25% turkey (liver, heart), 4% shrimp and calcium carbonate. Animonda Carny Adult - Beef with Turkey and Rabbit: 34% beef (lung, heart, meat, kidneys, udders), 17% turkey (liver, heart), 14% rabbit meat and calcium carbonate. Have you used Animonda Carny Adult before? Let us know what you think about this product.